Introduction - This page is written for the public, the police and the skilled set of people who make the drones. Now available this post as an ePub - read on your smart phone on Google Play Books (version 001b). Version Page History - version 001 was posted 13 March 17 (3.45pm uk). When page version 002 is made, I will let people know, maybe highlighting in yellow all the new additions. In my view, drones are much more than flying about taking pictures and recording videos. If we understand the technology and it’s potential, we can start to shape the use of drones as used by Emergency Services. Of course I’m not alone in this - there’s a mass of information available, so let’s get started splitting it up into bite sized chunks. And separate the fact from the fiction, the myth from the reality. 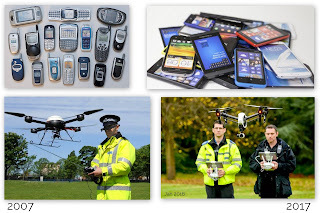 One Simple Image - As an example, on googling drone police, we see as one of the first this images. We can tell it’s a UK Police Officer in yellow high visibility jacket. I think most people would accept that image as a ‘current state of UK Police Drones’ - but is it? No. The image can be traced back to 21 May 2007 and seen in this BBC article with annotations where Merseyside Police are mentioned. That’s ten years ago and in my view many people will not or cannot google search effectively enough to persist in find the truth (right click image, select ‘search google for this image’ and a few clicks later select View Page.. that’s where I found the BBC post). Update 20 March 2017 - The Telegraph have reported today using this image and one other. For the public, who are new to the topic, this reinforces what a 'police drone is' - big clunky drone, officer wearing headset, long aerial on controller. Totally out of date. And in my view, news orgs have a responsibility to find latest images, not do a stock/getty search. Slide on right shows Phones and Drones 2007 and 2017 - phones easy to spot the older ones, not so with drones. If anything, opposite true -- the BIG drone headset looks more '2017' -- so NOT the case. 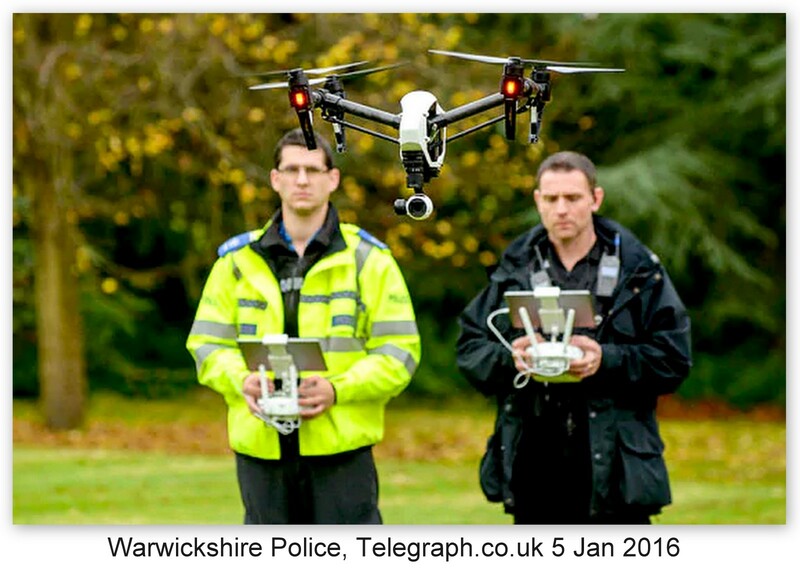 Update 3 Apr 17, Telegraph again with same image with text, 'Police aerial surveillance drone...PC Derek Charlton of Merseyside Police operates their new aerial surveillance drone in Liverpool'. On googling, we have that identical text at Express, 22 May 2007. Drone, UAV, UAS - I’ll use the term drone which seems much more widely used than UAV (unmanned aerial vehicle) or UAS (unmanned aerial system). See Google Trends of Google Ngram to compare. Some UK Police Forces have published their own stories, where some officers have tweeted. I’ll do my best to collate them. Twitter Moments are a useful tool to group together tweets, images and videos. For example: UK Police Fire Drone Resources and Essex Police Drone Resources. For the discussion piece, go visit - The Bobby on the Beat versus The Drone. If you’ve just stepped foot on British soil for the first time, or googled it from afar - what would you like to know about this topic, maybe something like.. In terms of UK Police and Fire, who are the main players? What drone tech are they sporting? And how do we know? In other words, have the police and fire told us themselves? Have the news reported it or was some other way - word of mouth even? National Police Chiefs Council - On visiting the site npcc.police.uk, there were 91 results for keyword ‘drone’, 94 for ‘drones’ (warning! Some results in this google search are NOT from npcc.police.uk site although appear to be so - be careful what you click on ie drones for sale/auctions). Top of the search results, this 28 page document called, ‘Guidance to Officers on Drones’ It’s labelled as 2015 and not protectively marked (last edit Jan 2916). It’s pretty useful in how the NPCC will publish papers like this - my guess not many people read them at all. If you do get curious, Section 4. Officer Actions is worth a read. 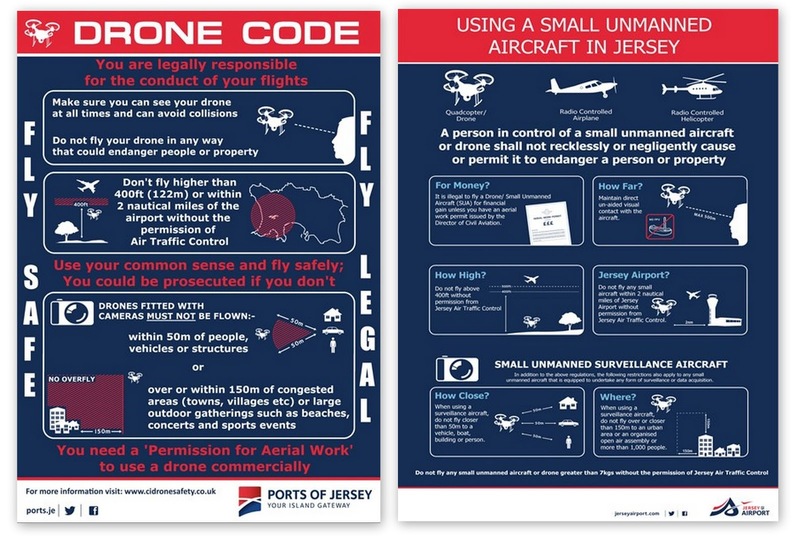 The link to Flying Drones from the CAA is invaluable. On page 25, there are eleven FAQs, again worth a read. Note, I have no idea if this guidance is still used - all I do know, it was on the internet, publicly at the NPCC site. UK Police Forces (from police.uk/forces). At this stage, I will google ‘uk police drone’ as general search. After that, I usually search anytime in the last year. Another variant I will use, searching each police force site ie site:https://sussex.police.uk drone returns 27 results, while site:essex.police.uk drone gives 8 results. As there are 48 force websites, I cannot tell if 27 or 8 is a high or low number of hits for ‘drone’. 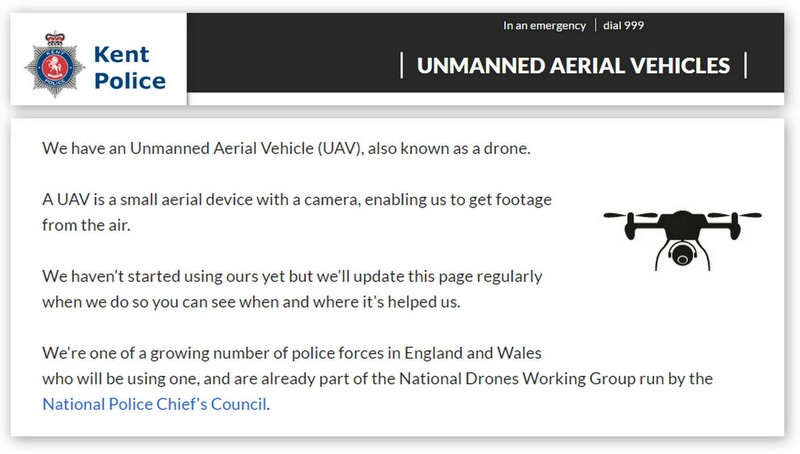 Thinking of a force website’s expectations, we may see a page dedicated to: Dogs, Mounted, Air, ANPR, Marine, Taser etc so my guess Drone maybe a breakout area. When the information starts to come if from my searches, I need to get a method to record each item just once (on this page). This is open to suggestion. In other swords, I do not want to add a link to a news article if I cannot verify or trust that news site. I would much rather a police force publish something directly from themselves and I record that in the section below. And following if a newspaper or TV Station say something, then that appears in the News section. Of course, the planet is awash at the moment with all this fake news. Last thing we need, to get this page muddied with ambiguity. For your information, I (as mike downes) is the sole author. If it’s wrong then all down to me. So what do we have so far then ..
Cleveland Police - Joint Fire Police collaboration, 'Drone to Give New Perspective on Football Policing Operation', 17 March 17, DJI Inspire. Devon and Cornwall Police - on twitter as Alliance Police Drones (3,688 followers as 12 Mar 17, 4,329 as 15 Jul 17). Edit 15 July 17 - On Twitter follow Chief Superintendent Jim Nye, commander for the Alliance Operations Department as @AllianceOpsDept. Video called 'Police Drone Unit' - watch out for DJI Mavic Pro..
Lots of press reports under banner, 'First UK police drone unit is launched in Dorset, Cornwall and Devon in a 'historic step' - Daily Mail, 'Full time flying squad, Yahoo News. Essex Police - on twitter as @epolicedrone (1,396 followers as 12 Mar 17). Tweet 24 March 17, 'Hard work by my team has paid off. CAA set to approve us to assess other prospective pilots as competent #Teamessex #Essexpolice. Lincolnshire Police - update 13 Aug 17, You can fow find @LincsCOPter on twitter (opened June 17), updates from the Lincs Police Drone Team. Insightful, in depth article here called, 'How will Lincolnshire police drones avoid RAF aircraft? 13 Aug 17. Well written and quotes from Inspector Ed Delderfield. 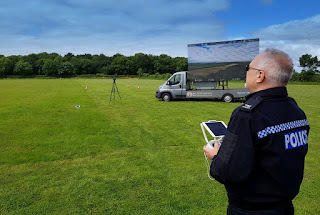 Surrey Police - have an excellent webpage divided into seven readable sections detailing the Aeryon Skyranger quadcopter model which can carry daylight/thermal and HD Cameras. Drones can be used for missing persons search, assistance in RTC, major crime, industrial accident, event planning and situational awareness. On 8 April 2016, details were published on how Sussex/Surrey Police have acquired four new Aeryon Skyranger (making five in total). Here’s the the Aeryon Skyranger features webpage -- all information is general to Aeryon, NOT Surrey Police (as I have no idea what model they are using). Sussex Police - Dedicated twitter account called @SussexEye, 'Tweeting the deployments of @Sussex_Police's drones'. South Wales Police - Pontardawe Off Road Drone Operation video narrated by PCSO Sian Jenkins, 22 Mar 17 It's a Yuneec drone. News post 6 Oct 16 - Yuneec drone. 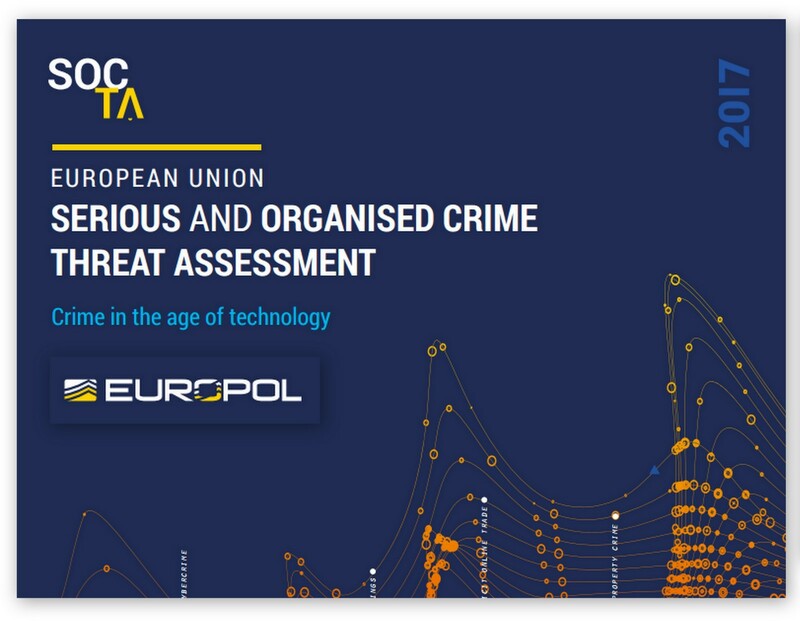 EUROPOL published SERIOUS AND ORGANISED CRIME THREAT ASSESSMENT Crime in the age of technology in March 2017. There are six mentions of the word 'drone'. 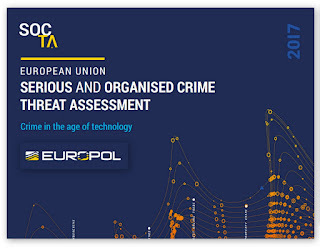 TECHNOLOGY AND ENGINES OF ORGANISED CRIME, p10.. ' technological innovation such as more accessible and cheaper high performance drone technology USING TECHNOLOGY TO FIGHT SERIOUS AND ORGANISED CRIME p25... This includes the use of advanced digital forensics tools, the deployment of predictive policing software driven by Big Data as well as drones for the monitoring of areas and large events. DRUG PRODUCTION, TRAFFICKING AND DISTRIBUTION p34.. Drone technology is expected to advance allowing drones to travel greater distances and carry heavier loads as well as making them more affordable. OCGs involved in drug trafficking will likely invest in drone technology for trafficking purposes in order to avoid checks at border crossing points, ports and airports. CONCLUSIONS.. p56 The impact of technology on crime, however, extends beyond the internet and involves all kinds of technical innovation such as advances in drone technology, automated logistics, and advanced printing technologies. Fire - As there are now 2,500 words in this post, as 20 March 2017, it's with great pleasure I'm making a dedicated UK Fire and Rescue Service Drone Resource Page. From Wikipedia - all links and copy/paste made 12 March 17 ..
“In 2014, it was reported that five English police forces had obtained or operated UAVs for observation. 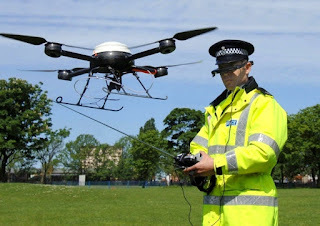 Merseyside police caught a car thief with a UAV in 2010, but the UAV was lost during a subsequent training exercise and the police stated the UAV would not be replaced due to operational limitations and the cost of staff training. “In March 2014, Sussex Police announced a pilot project using an Aeryon Skyranger for three months at Gatwick Airport. The project was funded by the Association of Chief Police Officers to test the effectiveness of the technology in policing. The equipment cost £35,000 with the training of four police officers costing £10,000. In October 2014 it was reported that five English police forces (Merseyside, Staffordshire, Essex, Wiltshire and the West Midlands) had obtained or operated unmanned aerial vehicles for observation. In 2007, Merseyside Police was reported to be conducting tests with a UAV. Merseyside Police caught a car thief with a UAV in 2010, but about a week later had to stop UAV operations as the UAV was not licensed. 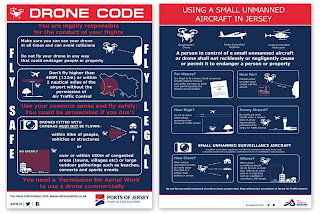 Regulations introduced at the start of 2010 required any aerial surveillance by unmanned aircraft - no matter the size of the drone - to be licensed. A licence was granted by the Civil Aviation Authority but the UAV was lost soon after during a training exercise in Aigburth, Liverpool, when it crashed in the River Mersey. and the police stated the UAV would not be replaced due to operational limitations and the cost of staff training. In the News - Reading the news can be hugely unrewarding while leaving you weak and battered by frustration. There's and endless set of Adverts to avoid, while each paragraph is written is such a way to send your mind asking more questions as you read. Perhaps the newspaper design it that way (far and beyond another topic). As a note, I've enabled an Adblock in Chrome as I cannot seem to negotiate the news sites without it. If you take the simple inverted pyramid style of journalistic writing, you get the headline, subtitle and most important information first. But these days, it's far from the case. In my view, a jumbled mess of information designed to get you clicking and for very little gain. Another shortfall, how news sites will make a claim or show some data yet fail to link back to where it came from. Leaving the reader to do all the leg work for themselves. An example, recently I saw plans for a new University Medical School Building - I had to google for plans and location as the news people just posted one architects drawing and a street. Thankfully, some mainstream publications make it their mission to include datasets - I take my hat off to them ie the guardian data blog. And yes there is a drone tag at the guardian site. At this early stage, I've seen a few news posts using phrases like 'could be used' which is again a waste of a reader's time. Especially when the article is written in a misleading way. Take this example, 'Met police could use DRONES to catch moped thieves in London as officers struggles with spate of grab-and-go thefts' daily mail, 6 Jul 16. 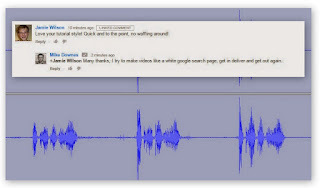 Read the post and walk away a little dizzy - what was said? A few suggestions, a reference to Devon Cornwall Police and nothing more. On a plus side, did you know Daily Mail have been banned from wikipedia? ref 8 Feb 17. SO in theory, I could do the same and not refer to any Daily Mail posts about police drones on this page. Drone Complaints and Crime - It seems when searching, there are many references to drones in the news for the wrong reasons. I would imagine any police use to be split into: 'How we use Drones and 'How we guard against the use of drones. Much in same way as the police use a 'patrol car' yet also safeguard against other 'cars' on the road like a lack of MOT, Insurance or drink and driving etc.